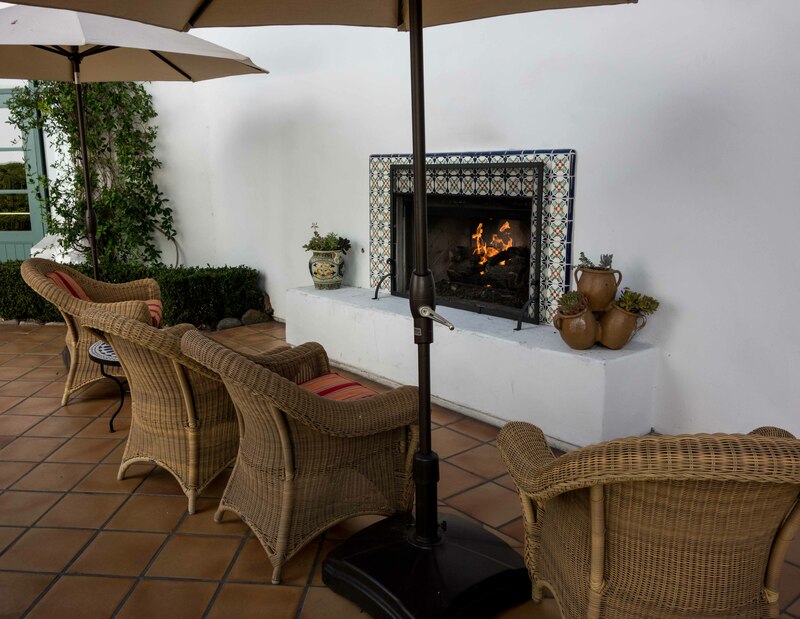 What do you do when you have a day all to yourselves in Santa Barbara? We took a ride to Ojai. I’ve always thought of Ojai as an “artists community” tucked in the hills behind Ventura. A place where movie stars had their hideaways, the home of Jaime Sommers, the Bionic Woman. Home to fabulous spas and resorts, where the rich and famous come for herbal cleanses, seaweed wraps and high class pampering. Sort of Carmel south. Ojai is a beautiful place, with too much traffic. It might have an art gallery or two, but certainly isn’t anything like Carmel, Santa Fe or Taos. The movie stars live behind gates and walls–Sophia Loren might be in town, but she wasn’t in the grocery store. The resorts, though. Wow. 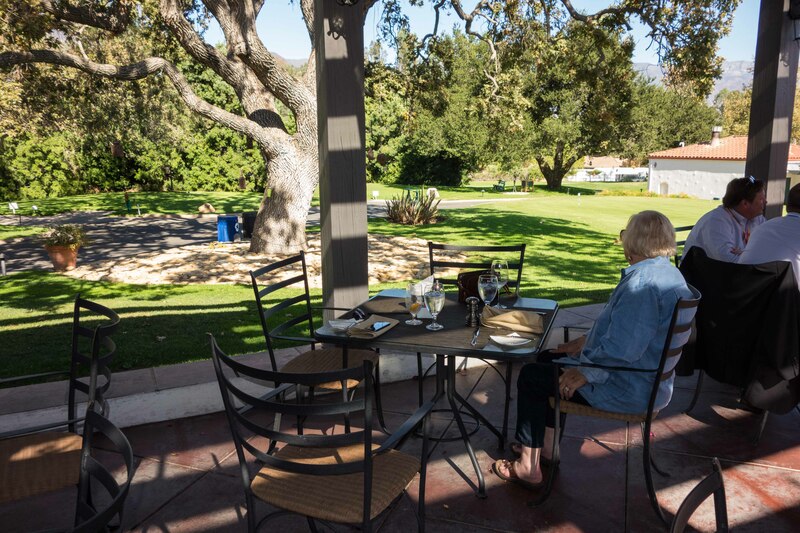 Or at least the one where we had lunch, the Ojai Valley Inn and Spa. Close to the city, it has a golf course with huge, ancient oak trees. Levels of service you can barely imagine. Great food. We went for lunch at their restaurant, the Oak Grill, and were just blown away right from the start. The valet parking attendants, dressed in impeccable uniforms, were incredibly smooth and courteous. The stroll through the grounds to the restaurant showed us a large facility, perfectly maintained, with amenities for the guests at every turn. Why a fireplace here? Why not? Just a walkway between buildings, so they put in a fireplace, lit it with gas, added a few chairs and an umbrella. Somebody might want to relax right there. I saw a bicycle rack, with the hotel name engraved in it. No bicycles, but there might be and the hotel is ready. There was an aviary with parrots and macaws, just for the heck of it. Artwork placed in the gardens. Every staff member well dressed and polite. This place is a dream. We ate lunch outdoors, in a large covered area overlooking the golf course. One of those ancient oaks, adding to the view. All this comes at a price, of course. The price on the guacamole is insane. I can’t imagine $21 for an avocado and chips. 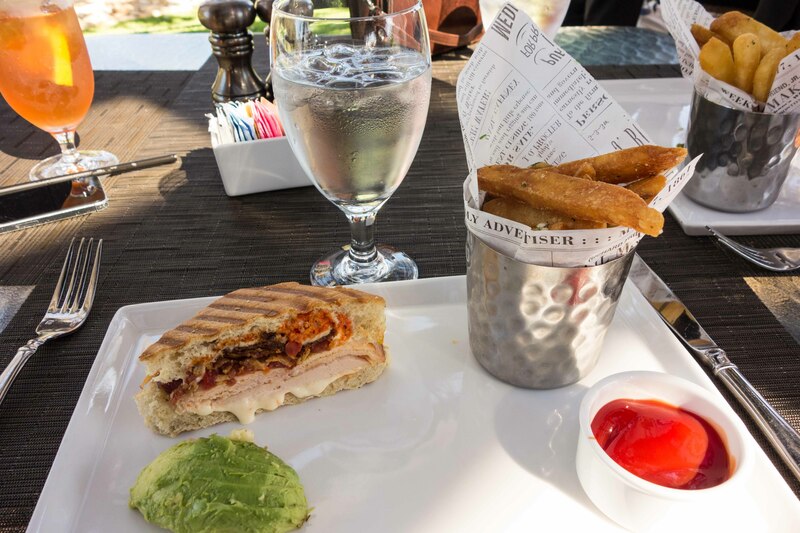 This resort caters to corporate meetings and retreats–most of their clientele is on expense account, and they all order the guacamole for the table to start, so the house just jacks up the price. The rest of the menu isn’t cheap, but it isn’t ridiculous, either. I can’t pass up a cold soup, and this one was excellent. You think of gazpacho as being tomato and loads of garlic, but the Spanish are considerably more flexible. 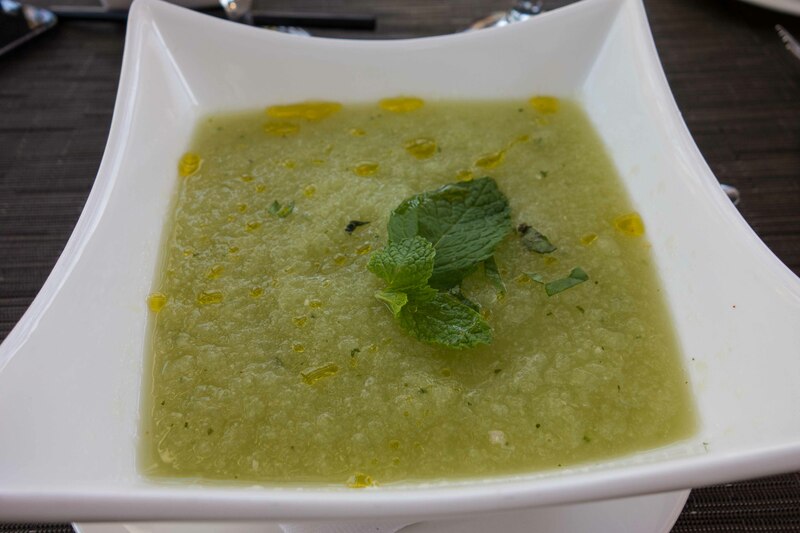 This soup was light and refreshing, the perfect starter for lunch al fresco. Gail and I split a sandwich. In another example of great service, the chef prepared two plates, each with its own fries. I was impressed. Half a chicken panini but a full set-up. Nice. You make a reservation, they know your name. The great places make sure the waiter knows, so you can be Mr. & Mrs. Pisarra, not “you guys”. This is one of the great places. Lunch over, we went back to retrieve the car. The valets offered us water (in bottles labelled “Ojai Valley Inn and Spa”) and a newspaper. No charge for the parking. Yes, I tipped well. After our meal, we drove all around Ojai, looking at the houses, searching for art galleries, enjoying the day. It’s a nice place, but nothing really special, with one exception. Ducks to the left of me, ducks to the right. Ducks, ducks and more ducks. And some geese. And that was all for Ojai. On the way back to Santa Barbara, we took a smaller road and wound through Carpinteria, which seems to be the home of every commercial nursery in the state, they were just lined up cheek by jowl for miles. Back at the house, we watched the Giants get crushed in game 6 then went out for a Cajun dinner at the Palace Grill downtown. Any place that serves a bread pudding soufflé is OK by me. Micky and Linda arrived, after watching the baseball game in San Luis Obispo with their grandsons, and we all turned in for a big day on Wednesday.